It’s been more than a week since we took notice of Brett Kimberlin fanboy Bill Schmalfeldt, who has been charged in Maryland with Internet harassment of Lee Stranahan. Before examining Schmalfeldt’s latest eruption of obscene idiocy, however, I’d like to treat you to an amusing blast from Schmalfeldt’s disreputable past. That was the headline on Schmalfeldt’s debut as the self-described “Brain-Damaged Troll” columnist at Technorati in January 2011. Bill’s theme was, as usual, completely wrong — the exact opposite of truth. Even as Schmalfeldt was ranting on about the Tea Party, “Rush Limbaugh and Glenn Beck and Sean Hannity and Bill O’Reilly” as the culprits in the Tucson massacre, actual reporters were quietly working to determine the nature of the madness behind Jared Loughner’s bloody crimes. Some friends have traced the start of his decline to his sophomore year of high school in 2005, when he broke up with a girlfriend. He dropped out of high school after his junior year and thereafter lost touch with many of his former friends, including Caitlyn Parker. On the day of the shooting which targeted Democratic Rep. Gabby Giffords, Parker was one of the first of the accused gunman’s acquaintances to push back against speculation that the crime had been perpetrated by a right-winger. No, Parker said in a series of Twitter messages, the Jared Loughner she remembered was “quite liberal,” even “radical” in his politics. Ah, so the dope-addled crazy was not a Rush Limbaugh listener, not a Glenn Beck fan, not a Fox News viewer. Well, what set him off? The two-hour video is anti-Christian, anti-American and anti-capitalist, and Jared Lee Loughner became obsessed with it. Zeitgeist, a conspiracy-theory documentary released in 2007, has spawned its own cult following. According to Loughner’s friends, the accused Tucson gunman was one of the cult’s most zealous converts. And many of Loughner’s otherwise inexplicable obsessions — from his fascination with currency to his rantings against illiteracy to his paranoid fears of “mind control” —parallel ideas promoted in Zeitgeist. So, the belief that Bill Schmalfeldt expressed in his Technorati column on Sunday, Jan. 9, 2011 — that the Tea Party and conservative media personalities were directly at fault for the Tucson massacre, and that the Right was dishonestly attempting to “reassign blame” — was 180 degrees opposite of the truth. In fact, insofar as the crimes of a madman can be said to have a political motive, Loughner’s motives were those associated with the radical Left, including 9/11 Trutherism, anti-Christianity and anti-capitalist beliefs not unlike those of the “Occupy” movement. So, while I covered Loughner’s actual motive every day for seven consecutive days (Jan. 12-18), Schmalfeldt lost interest in Loughner’s motives as soon as evidence emerged proving Schmalfeldt’s original “pin-the-tail-on-the-famous-right-wingers” smear was false. And here’s the thing: Bill Schmalfeldt never owned up to the falseness of his accusation. He continued being published at Technorati until November 2011 without ever once acknowledging that his very first column for Technorati was a big, fat, evil lie. There are many faults and personal shortcomings that can be tolerated in journalism. Deliberate malicious dishonesty is not one of them. You didn’t even crop the photograph. “was 180 degrees opposite of the truth” It’s called projection. The left do it all the time. Does Bill Schmalfeldt have children? I wonder what they think of dear old dad? The man is either in need of drugs for mental illness or an exorcism or both. 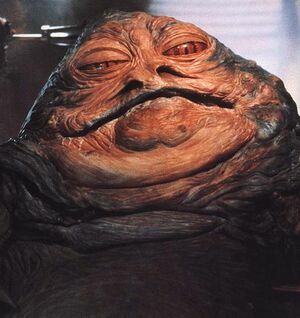 Bill Schmalfeldt and Jabba the Hutt separated at birth. See fah luto eetheen, ee yaba ma dukey massa. nah meeto toe bunky dunko. Slacker living at his computer indulging the darkness of his id on a 24/7/365 basis, with the kitchen handy, this is what that looks like. Thanks so much — looking at that photo, and particularly how Schmalfeldt’s head flows into his thick neck and huge body, I had a nagging sense I’d seen something similar before, I thought in a cartoon character. Clearly I was reacting to having seen Jabba the Hutt in movies years ago. Can’t help but think what a prize that big ol’ melon would be to some head hunter in a remote part of the world. I still say someone should check under his porch for bodies. If you look at Loughner’s mug shot and think Young Uncle Fester there was listening to anything other than the voices in his head, you’re an idiot. Taliban Suicide Bombers welcome SecDef Chuck Hagel to Afghanistan and Weekend Links! Who agonizes over whether to go be with their dying mother because they might miss some Twitter flame war, then blames the people he’s smearing because he almost missed her death? Barking moonbat. Seriously, do you know ANYONE whose top concern is what they might miss on Twitter when their own mother is dying? What a complete waste of skin. It would be pretty scary even after shrinking. That is to remind all the remaining ACC schools why Maryland will not be missed. Georgie is rather blunt and droll in his observations … Are you coming by for cigars and poker later? Apparently he was using his mother’s death as an excuse to get out of a court date, too. An excellent catch my friend, Bill Schmalfeldt does indeed have an account and posting privileges at Little Green Footballs. And LGF is on the BreitbartUnmasked blogroll. He is a unique specimen, that’s for sure. Initially I didn’t believe that there was a dying mother based on the premise that BS lies about every single damn thing. As it turns out, there was an obit for her and she looks like she was a wonderful person that BS would do well to emulate and I think it would be fascinating to figure out how he went that wrong in the first place. BS’s timeline still bugs me. His tweets show a strict 4 hours between waiting to board a plane somewhere in Maryland and sitting at his Mother’s bedside. Someone please tell me how a guy in a walker (supposedly) boards a plane, taxi’s on the ramp, flies a 1hr 45min route (if you fly direct, I see only stopover links to Milwaukee), taxi’s on the ramp, deplanes, negotiates airport, ground travels to nursing home, greets family, see’s dying mother, and then slams out a tweet; all in 4 hours. This is a guy who was moaning about shaking and needing to recover because cops delivered legal papers to his front door and he had to go out in his jammies and got his sockies wet. And he did all this high speed travel with nary a tremor? Not to mention dealing with one of the classic high stress events of anyone’s life, his mother dying. And all throughout he continues to slam out the tweets. Interesting too that all his posts ostensibly showing a picture of his Mother are from the obit notice. Also he flies out for the event but takes the train back? You banged right through it on Friday in 4 hours bucko, just do it again. Let’s try this one on: Mom actually died (requiescat in pacem), family told him no way in hell do we want you anywhere near here, BS stayed in his trailer and used the excuse to get out of the legal hearing. Separate and added fun: now he’s bitching Stranahan up for self-publishing a book. This from a guy who not only sel-publishes but self-reviews his books on Amazon. Not to mention that the self publishing stigma has died the final death with the e-publishing revolution. You need to get into this century Parky. Hilarious piece by one of the great self-publishers/self-reviewers who now criticize others for self-publishing. Irony thy name is, well irony actually, but if you had an alter-ego or illustrative example it would be Schmalfeldt. I love posting stuff on here about Parky cuz he reads it insatiably and he can’t block it here like he can on his site. Plus the ungrateful git left me out of the curse and I never knew he was Rom.